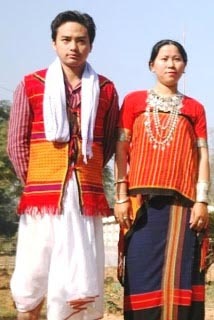 Chakmas are one of the major tribes of Tripura . Chakmas are known to be a tribe of South-East Asia. They have first migrated to Arakan Hill of Myanmar and then Chittagong Hill tracts of Tripura. A major part of them however migrated to Mizoram and Arunachal Pradesh in course of time from their original home land. According to Census Report of 2011 Chakma population in Tripura is 79,813. Their main concentration in Tripura could be located at Belonia, Subroom and Amarpur in South Tripura, Dhalai and North Tripura District at Chamanu, Gandacherra, Kanchanpur, Machmara etc. places. Among Chakma there are 3(three) major groups like (i) Anokia, (ii) Tandugia, and (iii) Mangla. Linguistically Chakma language is mixed with some words of Indo-Aryan language, Tibeto-Chinese and mainly Arakan language. Their language may also be described as a mixture of broken Bengali and Assamese language. Chakma have their own script in Burmese alphabets, though not in use, rather Bengali script is being used being easy to learn.